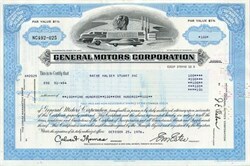 Beautiful certificate from General Motors Corporation issued prior to 1983. This historic document was printed by American Banknote Company and has an ornate border around it with a vignette of men next to futuristic looking vehicles (at the time). Some have numbers written in top margin. This item has the printed signatures of the Company's President and Secretary and is over 26 years old.